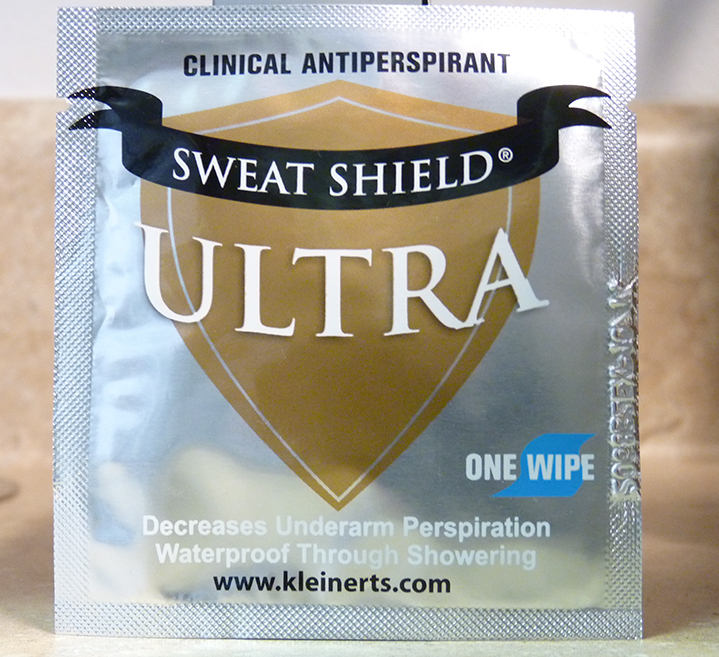 Try a free foil pack sample (1 pack) of our great, new Sweat Shield Ultra.It is our advanced clinical antiperspirant product that in an enlarged 4" x 4" wet-wipe towlelette.This is outstanding for stopping sweat on your scalp. face, underarms, torso, groin, legs, or feet.This will block your pores (in the area applied) from sweating from 2-7 days. This advanced and effective product features an enlarged wipe with an FDA maximum strength formulae (15% aluminum chloride) and extra aloes for no irritation anytime. So why sweat it! Relax and get back into life now.Just ask for the Ultra with style number SSU01T and we'll be happy to include it with your order. Thank you for giving it for free! How to collect sweat shield from you. Just send over your full address and we will send it to you (within the USA).Otherwise add postage and internationally can also be done.